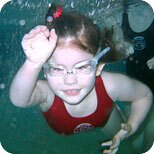 During swim lessons, the kids do a lot of swimming with their goggles on. However, in an emergency situation such as falling off a dock or boat, they may not have their goggles on to be able to see. To prepare kids for this, we have them practice jumping in, going down the slide, and swimming without their goggles on. They may also not be in just a swim suit, so we also have them practice wearing street clothes so they can feel the extra weight and how to manage it. Children may wear lifejackets while they are around water or riding in a boat, but do they actually know how to swim in them? Lifejackets do not automatically bring kids upright in the water. We have our students try on lifejackets, and then practice swimming and floating in the water while wearing them. If a lifejacket is too big it could pull up over the child’s head. Make sure your child is always wearing the correct size lifejacket for their age and weight. It should fit snug around them without being too tight. Always double check that the straps are tightened rather than assuming they are still tight from the last time it was worn. During safety week we teach kids how to help someone struggling in the water. They shouldn’t go out to the victim in the water because they could pull them under the water with them. Instead, they should grab a nearby long object such as a pole, or life preserver, and reach/throw the item to them. However, they should only do this while laying on their stomach for good traction. If they are kneeling or standing they could get pulled into the water. These are just some examples of safety techniques we teach in our swim lessons that you can also work on with your children. You can have your child practice in a safe and supervised area swimming with street clothes on or a lifejacket on, and without their goggles. You can also pretend to be the victim struggling in the water and have your child help get you to safety. Never have the child be the victim in case they really do struggle in the water unless there is another guardian in the water to help them if needed. Teaching our children how to be safe in and around the water can help save their lives! Are you interested in Swimtastic Swim Lessons for your little one? 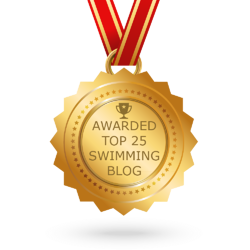 Perhaps for yourself if you've never learned to swim? Swimtastic offers lessons from toddler through adult! If you are interested in learning more about available lesson programs register today!